Solar companies haven’t fared well so far this year, so it’s not surprisingly that Applied Materials, which makes factory equipment for solar, also has seen a drop in demand. The company reported on Wednesday a 12-percent fall in sales between its two most recent quarters. Applied Materials (s AMAT) recorded $563 million in sales for its solar division for the third fiscal quarter. That number is a big increase from the $387 million in sales from the year-ago period but a deep dive from the $637 million from the second fiscal quarter of this year. Applied’s CEO, Mike Splinter, struck a positive note by saying that demand is returning after the market saw a bumper crop of solar panels sitting in warehouses for the first six months of 2011. Falling government subsidies and uncertainties about the extent of the incentive cuts in two biggest markets, Germany and Italy, caused the inventory buildup and falling prices this year. Gross margins of solar panel makers slid 25 percent in the first half of this year, and the average price of silicon solar panels dropped from about $1.80 per watt in the first quarter to below $1.40 per watt currently, according to an IMS Research report last month. The prices were falling at a faster clip than the manufacturing costs, IMS said. Applied wouldn’t see a big jump in sales if manufacturers don’t want to buy new factory equipment. 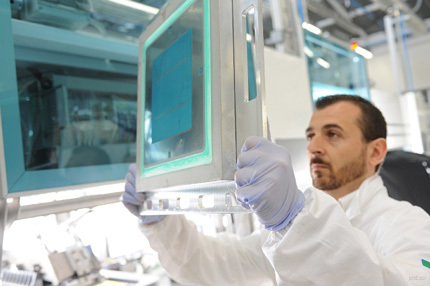 In solar, the company mostly sells equipment for making silicon wafers and cells. A solar panel contains dozens of solar cells to convert sunlight into electricity. “Solar panel demand is now accelerating following a slow start in the year,” Splinter said during a conference call with analysts on Wednesday afternoon. 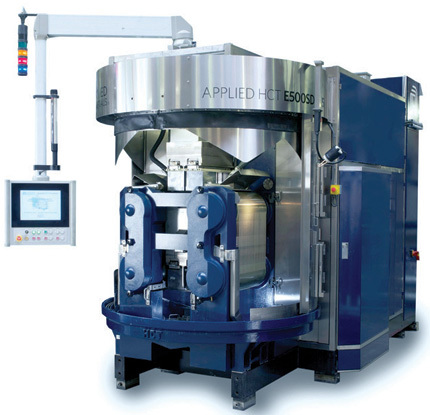 Applied also sells factory equipment for making computer chips and display panels for TVs and other consumer electronics. But it’s too early to say the worst is over. Some solar panel makers, such as SunPower (s SPWRA), First Solar (s FLSR) and Suntech Power (s STP), also believe demand will return in the second half of this year. Other manufacturers that have posted poor financial results in recent weeks included First Solar, Trina Solar(s TSL) and JA Solar(s JASO). Splinter said the market is set to grow significantly in the United States and maybe China. Earlier this month, the Chinese government announced a new set of solar incentives that will guarantee solar electric pricing for project developers. This type of incentives, called feed-in tariffs, has made countries such as Germany and Italy the largest in the world. Feed-in tariffs aren’t as common in the United States, but many states in the country are requiring their utilities to sell an increasing amount of renewable energy. To meet these mandates, utilities often shop around to buy solar, wind or geothermal power from developers who build and operate the power plants.